The leading department store chain and a regional mall owner are both high-yield dividend stocks with lots of potential for capital appreciation. As interest rates for government-guaranteed bonds and CDs have risen over the past couple of years, dividend-paying stocks have lost some of their shine in the eyes of investors. That said, there are still some dividend stocks that yield far more than high-quality bonds or CDs. Of course, dividend stocks come with risks. For one thing, if the stock price plunges, that could more than offset any dividend payments. Additionally, it's always possible that a company will reduce its payout. Macy's (NYSE:M) and Pennsylvania Real Estate Investment Trust (NYSE:PEI) are two dividend stocks with extremely high yields following the recent market sell-off. Moreover, they both offer meaningful opportunities for capital appreciation in 2019 and beyond. Macy's has had a very solid performance in 2018. Through the first three quarters of the fiscal year, comp sales rose 2.7%, driving a return to growth in its earnings before interest, taxes, depreciation, and amortization. The company's sales growth strategy is just starting to pay off, so there could be further sales gains ahead in 2019. Macy's has posted solid sales growth recently. Image source: Macy's. Meanwhile, Macy's debt repayments have lowered its interest expense and tax reform has substantially reduced its effective tax rate. This has driven a 56% surge in adjusted earnings per share to $1.45 on a year-to-date basis. Nevertheless, Macy's stock has given up most of the gains it achieved in the first half of 2018. On Thursday, the stock fell back below $30, lifting its dividend yield to an impressive 5.2%. Macy's $0.3775-per-share quarterly dividend works out to an annual payout of $1.51 per share. That's less than half of the company's projected 2019 EPS of $3.63, so the dividend seems fairly secure. In fact, while Macy's hasn't increased its dividend in more than two years, it could potentially do so in 2019, having slashed its debt load by nearly $3 billion since early 2016. With a much-improved balance sheet and ample free cash flow, Macy's could also resume its share repurchase program in the coming year, driving EPS higher. Considering that the shares now trade for just eight times forward earnings, Macy's looks like a great dividend stock that could also deliver substantial capital appreciation in 2019 if sales trends remain solid. As generous as Macy's dividend looks, it pales in comparison to the yield that PREIT stock offers today. Shares of the mall owner have lost half of their value since June -- including a big drop in the past week -- and fell below $6 on Thursday, putting them at their lowest level since the Great Recession. Based on its Thursday closing price of $5.80 and quarterly dividend of $0.21 per share, PREIT stock has an incredible 14.5% annualized dividend yield. PREIT 2018 stock performance. Data by YCharts. 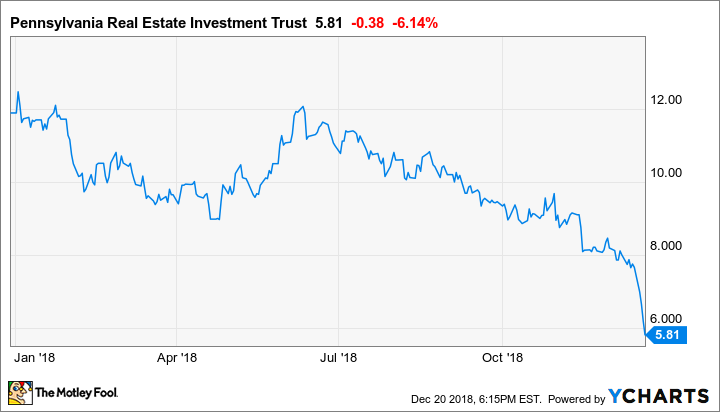 Between the huge drop in PREIT's stock price and its sky-high dividend yield, you might think that the REIT's earnings power is plunging and its dividend is clearly unsustainable. However, PREIT is fairly well positioned, despite the liquidation of regional department store operator Bon-Ton Stores earlier this year and the potential liquidation of bankrupt Sears Holdings in 2019. Indeed, PREIT has been proactively replacing the weaker department stores at its properties with stronger tenants. In fact, there are only eight unfilled Sears and former Bon-Ton stores left in PREIT's portfolio, several of which are at malls that are mortgaged and may be handed over to the lenders in the next few years. For the most part, PREIT's malls are performing quite well. Management expects funds from operations (FFO) -- a key earnings metric for REITs -- to come in between $1.52 and $1.57 per share this year, down just slightly from $1.58 per share in 2017. PREIT expects to add $14 million in annualized rental income ($0.18 per share) by 2020 from completing redevelopment projects at several malls. Furthermore, its $400 million Fashion District Philadelphia joint venture project is slated to open next fall. As a result, FFO will likely return to solid growth in late 2019 or 2020. There is a chance that PREIT will reduce its dividend somewhat to free up more cash for future redevelopment projects. But it would still offer a very high yield, and that redevelopment work could pave the way for a return to strong earnings and dividend growth after 2020. Between these two dividend stocks, Macy's looks like the lower-risk bet for investors. Sales and earnings are already moving in the right direction, so it may not take much to get investors excited about the stock again. Additionally, Macy's has a massive trove of real estate that is likely worth more than the company's enterprise value, providing a measure of safety. PREIT is riskier, because it has a high debt load and could continue to face some headwinds from anchor store closures in the next few years. That said, most of its malls are desirable properties that should remain vibrant shopping destinations for the foreseeable future -- and the stock offers more upside than Macy's. Indeed, if it can get FFO growing again, PREIT stock could more than double in the next two to three years.